Hiking in Missoula means endless mountain trails, views of the valley and paths leading to hidden wonders that are just begging to be discovered. Wildlife and beautiful scenery are just a couple of the things that you will find hidden away in Missoula's surrounding mountains. From the top of Mount Sentinel to the top of Snowbowl, Missoula offers plenty of hiking options and ranges. It would be impossible to give credit to each every must-do trail in the Missoula Valley. There are simply too many choices. Here are a few suggestions to get you started. The irresistible Riverfront Trail begs to be walked, run, biked or skated. This flat, paved path borders the south side of the Clark Fork River, which means it’s easily accessible from the University of Montana and Downtown Missoula. Burn calories from Orange Street to Washington Grizzly Stadium, a distance of about a mile and a half. At the far east end (by UM), the Riverfront Trail changes to gravel and becomes the Kim Williams Trail. Sandwiched between the Clark Fork and Mount Sentinel, the Kim Williams Trail continues on for two and a half more miles. Branch off on the uphill Hellgate Canyon Trail if you feel like conquering Sentinel’s summit. Hike the M. You must. You can’t spend time in Missoula without noticing the huge white “M” set against Mount Sentinel. Beginning on the UM campus, it’s a steep three-quarter of a mile climb to the “M” and an additional one mile to the top of the mountain. The views of the Missoula Valley, the Clark Fork River, and the distant mountains are spectacular. The trail to the “M” is made up of 11 switchbacks and boasts an elevation gain of 620 feet – something you can boast about once you’re done. From the top of Mount Sentinel, you can see Hellgate Canyon, Mount Jumbo, where you can note the water lines from Glacial Lake Missoula, and the Rattlesnake National Recreation and Wilderness Area. From there, you can take the Crazy Canyon Trail into Pattee Canyon, which links to the Kim Williams Trail. Super popular with dogs and their two-legged counterparts, Blue Mountain Recreation Area is an easy two-mile drive southwest of Missoula. 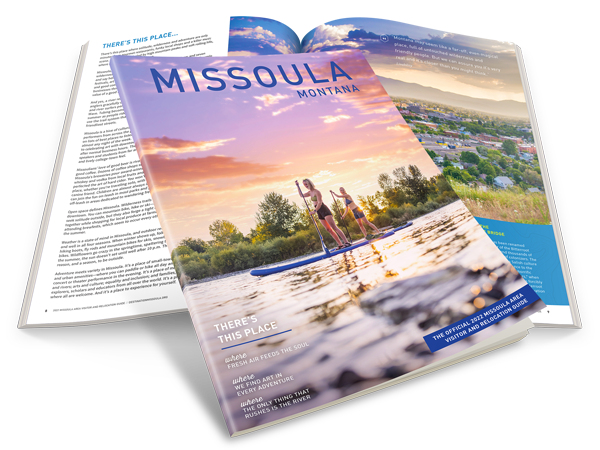 A nice mix of easy walking and steeper climbs, Blue Mountain boasts expansive meadows (keep an eye out for the most gorgeous blue butterflies) and great views of the Missoula Valley, including a self-guided nature trail. Be prepared for horses, mountain bikers and plenty of happy dogs. Waterworks Hill is a favorite among locals. Located just off Greenough Drive, Waterworks is an easy, scenic in-town hike. The treeless stretch may seem barren on first glance, but on closer examination, you’ll find some pretty remarkable plant life. Montana’s state flower, the bitterroot, blooms in the spring. Be on the lookout for birds and foxes.